"The host thus forming a single united body, it is impossible either for the brave to advance alone, or for the cowardly to retreat alone. This is the art of handling large masses of men." - Sun Tzu. And so 2012 comes to a close, not with a bang but a whimper. Here is the Choson Korean army built in honor of my beloved canine companion, Changun - who through a series of unfortunate events is no longer by my side here on this earth. The stand for the Army General includes a figure of him in miniature. 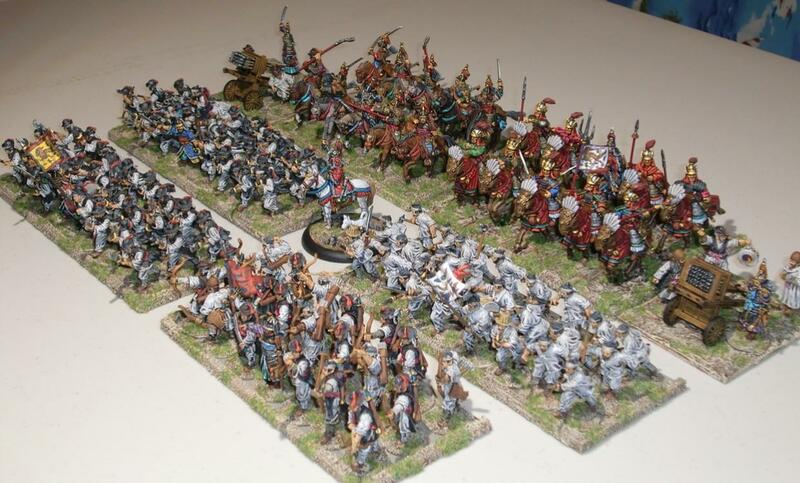 All of the figures are Perrys, with the exception of the Changun miniature and the allied "Ming" Chinese cavalry. The dog mini is a modified Black Cat Bases figure, and the Chinese are from The Assault Group - actually Song Chinese, but close enough. I wish all of you well in the coming New Year and hope you all have a great time painting and gaming. Warmest Regards to you all. This is that plastic figure from Flying General Workshop that was advertised as 1:56th scale. It is probably closer to 40mm, though. I decided to paint it up anyway - and will give it to one of my wife's friends as a Christmas gift. Her friend always looks at my figures in a cabinet and asks if she can have one. She can't understand why my wife tells her no because I have to use them all. Anyway, I hope she likes this over-sized figure that can't be used with my 28mm stuff. Her husband is a retired SF guy who practices Korean and Chinese martial arts - mainly staff weapons - so I had to make sure this figure will stand up to his scrutiny. This is taken straight off of the box (the only thing in English, as everything else is written in Chinese): "Huang, Zhong - One of the Five Tiger Generals of Shu Han. Huang Zhong had always been portrayed in popular literature and arts as an elderly general with youthful vigor and constitution. Even now, the spirit to strive for excellence despite old age is often attributed to him." I painted the figure as one piece - the rider was glued to the horse and everything sprayed black for an undercoat. For some reason, I painted the horse first and then the rider - kind of out of normal sequence. Bright colors were chosen, as this seems what is depicted in Chinese art. It may not be apparent in the photos, but the head of the rider (Huang Zhong) is really about 28mm, but the rest of him and the horse are much larger in scale. Here he is compared to a 28mm T.A.G. Song Chinese cavalryman. On the gaming front, my buddy Pat Lowinger and I got in a nice WAB refresher game today at The Game Matrix. 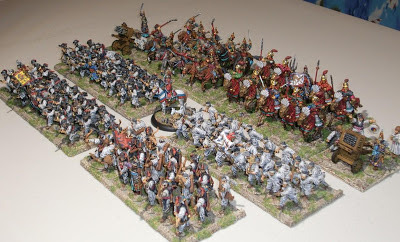 My Trojan War Chariot army defeating his Successor army. 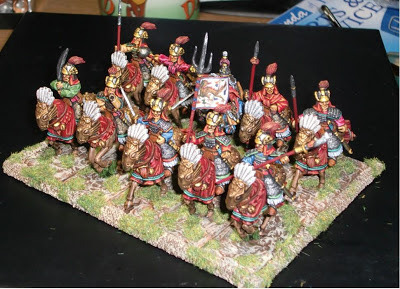 He did leave out his elephant today - so next time it may get a bit more complicated for my Chariot army. On the home front, my oldest son will be home tomorrow on leave for about a week from his Air Force technical training. He's been gone for a total of 6 months - which includes his basic training. We can't wait to spend some quality time with him - especially during the holidays. Happy Holidays to all. Still need to add a banner to the guy with the trident - also looking for an appropriate figure to round the unit to 10. Addendum - based on a movement tray with a Korean officer added to the rear rank; also a modified Perry Choson flag - a tail was added. 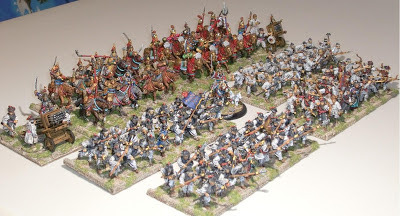 I plan to use these as Ming allies for the Choson Korean WAB army. 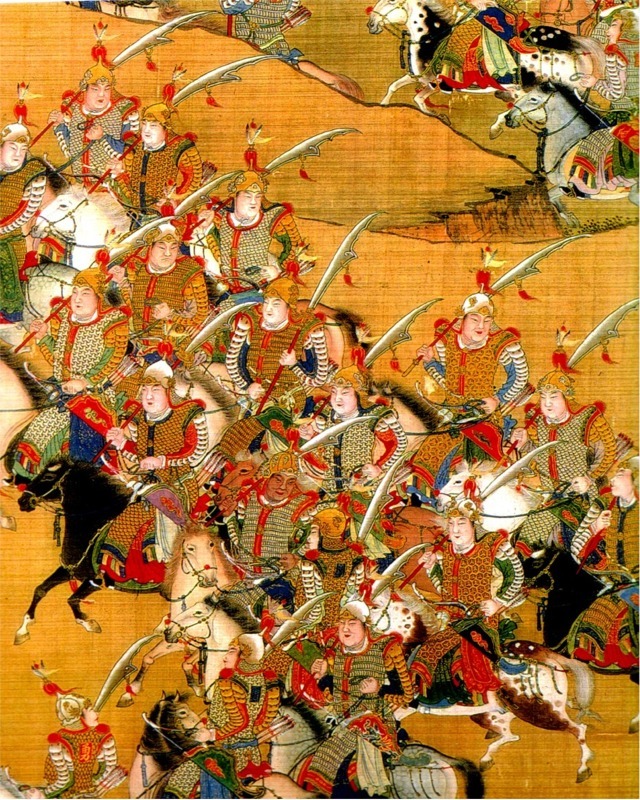 I did a little internet research for these guys and noticed most illustrations of Chinese metal armor from this period is shown to be iron or steel. I would’ve thought they’d use bronze, but it appears the Chinese moved away from bronze quite early on – at least for the most part. As this unit is supposed to represent Song Dynasty troops, they are a bit anachronistically armored. By the time of the Song, most armor was brigandine, or coats of plates, types very similar to what the Koreans wore – or vice versa. However, I wanted a contrast for the Chinese, so figured the exposed metal armor would make them look more foreign or exotic, as allies should. 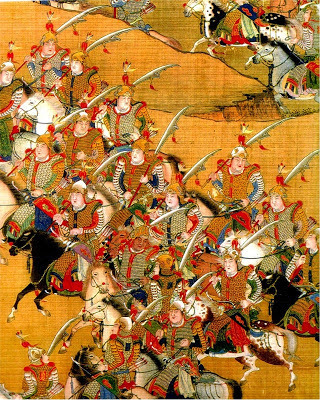 Possibly the more elite Song units may have retained this type of armor, but I’m not sure if any of these types of troops were deployed in the Imjin War. This unit should complete the Choson Korean WAB army. 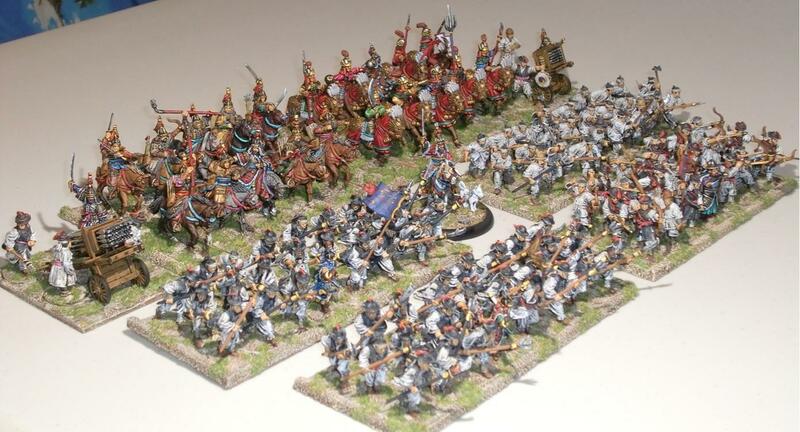 I would like to add a unit of unarmored Choson Korean mounted archers, if the Perrys would ever make them. The next image is a period painting of Ming cavalry - they are heavily armored and the helmets are similar to the ones worn by the Song cavalry above. The horses lack any armor or barding though. Granted the dynasties typically ran through several centuries, so some overlap in appearance would be plausible. The T.A.G. 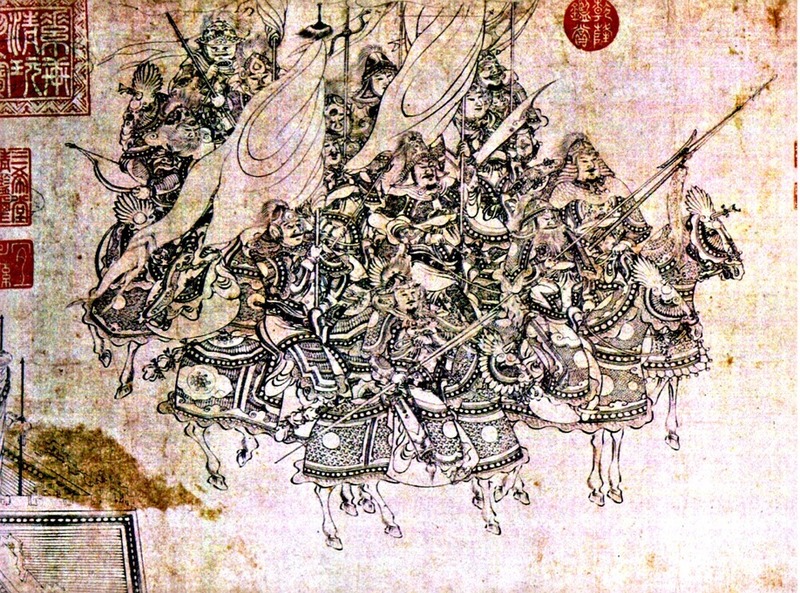 figures strongly resemble the cavalry illustrated below in a Song Dynasty manuscript. Started on the riders - just a little tidbit, but I'm trying to get back into painting more. I can't figure out what kind of weapon the third guy on the right is holding in both hands (like large maracas). It's from the pack with "exotic" weapons. The Ancient Chinese sure came up with some strange weapons. Here is link to some nice images of Ming Chinese. I plan to use these Song guys as Ming allies for a Korean Imjin War army. Here are the horses for a unit of Song Cavalry from The Assault Group. Although they have a style all their own, they are very nicely sculpted. I picked these up from a very generous TMP sale offered by TMPer Iain - aka "The Hobbybox." He still has a ton of other TAG figures for sale. I have some TAG Samurai and these are similarly styled/sculpted - somewhat stiff, but not excessively. Proportion-wise they are pretty good - IMO. These have been given highlighting after a block paint job and Minwax Tudor Satin stain. The stain is pretty old and is getting very thick - I used a lot of thinner and the result isn't as good as if from a new can. Here they are with a basic block paint job. Krylon Brown Boots Satin was used as a basecot. In other news, I had ordered some figures made by a Chinese company called Flying-General Workshop. These were on sale at the Michigan Toy Soldier Company.